Top 10 Innovative Gadgets Of 2011 That People Loved ! We are once again at the end of the year, with lots of incredible innovation around. Year 2011 can be seen as the year which recorded fabulous novelties in the field of handheld and smart gadgets. This year brands like Samsung, Nokia and Apple rock the market with their high end creations. The 2011 was full of exciting news and hypes, where Samsung marked the high recognition with lucrative launches and where speculations on most anticipated and awaited Android based tablet ‘Aakash’ create news on launch and its delays. All and all, the year was hot for the gadgets makers facing and giving neck to neck competition to other brands and for user community, who were getting the benefits of high end innovation. So without wasting anytime, At Digital Conqurer I would like to take the privilege to reveal the top 10 best innovative gadgets of the year 2011. Starting with the innovation from Apple, this year Apple launched the iPhone 4S which was supposed to be the last innovation under the guidance of Late. Steve Jobs, the founder of Apple. At the price range, which was 4 times the US retail price; where it was mandatory for the customer to buy the data service, Apple iPhone 4 S still taste the success in the Indian mobile mania. The selling point of this device lies in its faster speed, better sensitivity of the camera and the ‘Siri’, the voice assistive tool which makes iPhone different from other handheld gadgets. After the huge success of Apple iPad, hot buzz where already there on the enhanced version of iPad and it came up as the iPad2. iPad2 dominated the 10 inches tablet mania which was captured by the tablets from Samsung and other Android based devices. The device came with thin appeal and with less weight compared to its predecessors. Inheriting the same 9.7 inches LED backlit LDC display, the device showcased the enhancement in the processing speed with dual core A5 which offers twice power and enhanced graphics performance along with the battery backup of 10 hrs. Apple left no point for disappointment to the Apple lovers. MacBook Air is the series which force you think ‘how the power of Intel’, ‘capabilities of mainstream’ and ‘extreme power with attractive graphics’ can be packed into sleek and slim body. The new MacBook Air is although not light as feather, but it is amongst the sleekest and the lightest powerful and innovative gadget available in the digital market. With MacBook Air, Apple Began the anorexic trend and with the success of MacBook Air series, Apple came up with MacBook Air 13 to take the charisma to the next level. This notebook is versatile and a style icon with the capabilities of mainstream. Samsung has come up as the biggest competitor to the Brand name like Apple and Microsoft. 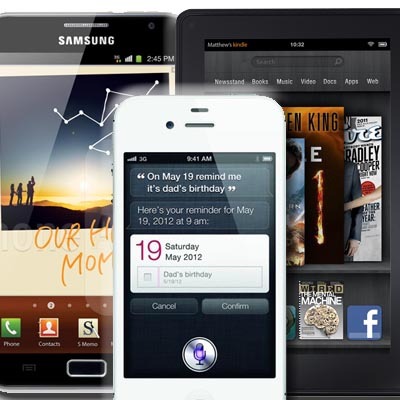 With the Samsung Galaxy S II, the company created the milestone by selling 10 million handsets since its launch. The device is poured with enormous capabilities like dual core 1.2 GHz processor supported by 1 GB or RAM and AMOLED touch screen display which provides stunning clarity, brightness and extreme sharpness. This Camera phone has the capability to capture detailed images with its 8 MP lens and also allows high quality of video conferencing with 2MP front camera. Samsung Galaxy Nexus gather a lot of attention by becoming the first smart phone to come with the Ice Cream Sandwich, which is the latest version of Android. Nexus is supposed to be considered the top breed in the Android mania and hence in the year 2011, it got the pleasure to become the first Android based handset to received the latest ICS update. This 4.65 inches touch screen smart phone is equipped with great capabilities which make it a top contender to compete the empire of Apple. Nexus is packed with extreme functionalities to enhance the experience of web surfing, watching video at HD and for accessing many other apps. Along with marking huge recognition in the Mobile mania, Samsung left no point to impress their user community. Samsung Galaxy Tab 750 which is also known as Galaxy Tab 10.1 is seen to be threat to the Apple Empire. The device operates at Dual core processor Tegra 2. The device is fabulous with 10.1 inches touch display and with less weight compared to Apple iPad2. However, Apple is ahead of providing more apps for its device compared to Samsung but still Galaxy Tab users will have close to 200,000 fishes to catch. The first question which you will ask yourself on the first look to Galaxy note is that: Is this a Mobile or a Tablet? Well Galaxy Note is a new member to the Samsung innovation group coupled with the capabilities of Tablet and Smart Phone. The device is equipped with massive 5.3 inches of HD display with is powered by the 1.4 GHz dual core processor supported by 1GB of RAM. The device is launched in to variant: 16GB and 32GB built in storage. Note has worked on the weakness of Dell and other competitors and has come up with the useful devices with high capabilities. 2011 also recorded the turning up of e-commerce giant into the digital innovator which comes up with the Kindle Fire, the common man’s tablet by Amazon. Amazon has given tight competition to the digital gadget giants like Samsung and Apple by developing the affordable breed of tablet which was not the clone of iPad or any other device, instead Amazon tried to play with the weakness of the iPad. What makes, the Kindle fire best it its affordable price in which the users will enjoy the 7 inches touch display, features like nonstop streaming, unlimited cloud space and brand name of Amazon. Market as the world’s cheapest tablet, ‘Aakash’ already collected lot of hype and news on various reasons. Right from its inception, it has been the most talked about device for which users are still waiting for. Delivery of ‘Aakash’ as been delayed and Indian community have to until January 2012 to get the device at their doorstep. This year, Nokia holds the hand of Microsoft and came up with the Nokia Lumina 800, which is the first Windows based mobile from Nokia. This sporty look handset has been packed in polycarbonate body with 3.7 inches glass display. The device is powered by 1.4 GHz processor and has the capabilities to capture quality stills with 8MP Camera. All we can say that, Nokia this time also delivered the best to their users. So, these were the findings of DC for now and we hope that next year will gonna be more exciting and innovative and we will come across more dynamic gadgets in 2011. Chinese Smartphones: What Should You Know?